Dynamic elegance, sporty aesthetics and a strong character – these attributes characterise the BX5’s superior and confident appearance. The design originates from the Borgward Design Centre in Renningen near the corporate head office in Stuttgart. A committed team of designers works on consistently ensuring the high design quality and uniqueness of the young as well as traditional Borgward brand when developing new models. 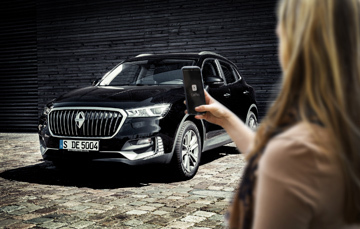 Smartphones can be extensively networked with the vehicle using the Borgward Connect Intelligent Connectivity System. The driver therefore has unhindered access to all smartphone functions. Conversely, smartphone apps give the authorised user specific access to the vehicle at any time and anywhere. Thanks to WiFi hotspots integrated into the vehicle, occupants can also log into the internet with end devices such as smartphones, tablets or netbooks. remotely. The vehicle can also be located, opened or closed remotely. A tracking function and the vehicle immobiliser help in the event of theft. 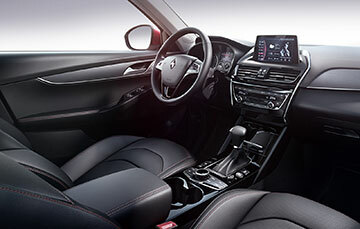 Depending on their preferences, the driver has the choice whether they want to access and operate the infotainment menus using the direct access buttons, turn and press controls positioned in the centre console or the 12.3 inch touchscreen positioned centrally in the dashboard. The buttons and rollers on the ergonomic three-spoke steering wheel allow you to access various vehicle functions in the central cockpit display. The central touchscreen can be operated like a smartphone display using different finger gestures and some of it can be freely programmed. The driver can arrange the panels to suit their preferences. The passive safety equipment unfolds its maximum protection potential. For the different kinds of crashes, such as head-on, side or rear collisions, alongside the belt systems there are also up to six air bags provided, which are activated as required depending on the severity of the accident and can dramatically mitigate the consequences of an accident on the occupants. These include two-stage hybrid air bags for the driver and front passenger, side air bags for the driver and front passenger and curtain air bags over both rows of seats. So that the passive safety equipment remains as inactive as possible, the Borgward BX5 offers several preventive driving dynamics and driver assistance systems that can prevent accidents as part of the “B-Safe” concept. These include, for example, the blind spot alert, road sign assistant, fatigue alert or “pre-filling” the brakes in the event of rapid deceleration. With its comprehensive “B-Safe” safety concept the Borgward BX5 meets all the requirements with regards to maximum safety for its occupants, as is typical of the brand. Active safety features can preventively identify potential hazards and therefore help avoid accidents. The vehicle structure and restraint systems also give the SUV the potential to pass international crash tests and safety ratings with flying colours.